Our Americana Series addresses four elements crucial to producing the world's first series of strings directed to the needs of players performing within this exciting genre of contemporary music. Our own roots go back decades as one of the premier string manufacturers with an abundance of knowledge in string design that incorporates innovation into materials selection and string construction, while utilizing preferred gauging based on many years of input from our GHS Artist Family. 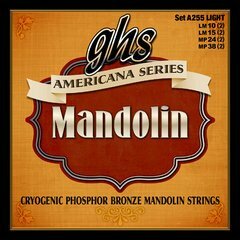 Add in cryogenic treatment to extend the life and enhance the tone for a series of strings that will have acoustic guitarists, bluegrass players, country, blues, R&B and roots-rock performers embracing the GHS Americana Series of strings.